The National Rifle Association (“NRA”) conjures up many things for many people: gun lobby, gun rights, 2nd Amendment, just to recite a few. It’s name, however, has rarely arisen in the intellectual property context until recently. Here is some background. a liberal insurgency is destroying American society. The “only way” to protect yourself from this surge in left-wing violence (a made-up threat, to be clear) is to donate to the NRA – an organization that exists solely to help people buy guns…. A derivative work is a work based on or derived from one or more already existing works. … Only the owner of copyright in a work has the right to prepare, or to authorize someone else to create, an adaptation of that work. … The unauthorized adaption of a work may constitute copyright infringement” (emphasis added). It appears that the NRA created an infringing derivative work but there is another question for consideration. Does the NRA’s use of the image qualify as fair use? If it does, the NRA did not need a license. Under Section 107 of the Copyright Act, “fair use” must fall within defined categories: “criticism, comment, news reporting, teaching …, scholarship, or research.” If the work qualifies, fair use determination requires a further complex analysis of four factors: (1) the purpose and character of the use, (2) the nature of the copyrighted work, (3) the amount and substantiality of the portion used in relation to the copyrighted work as a whole, and (4) the effect of the use upon the potential market for or value of the copyrighted work. The results of the four-factor analysis are not always predictable, making fair use a tricky area of the law. So, does Clenched Fist fall within one of the required fair use categories? It would not be unreasonable to conclude that Clenched Fist is “comment” but does “comment” embrace political speech? It might, so there may be First Amendment reasons to dismiss Kapoor’s suit. Yet, the First Amendment rationale could be outweighed by the commercial purpose of the video. Then again, Cloud Gate appears for less than a second (the “substantiality” test). That may not matter, though. The video displays a fleeting series of iconic and recognizable American architectural and sculptural works. 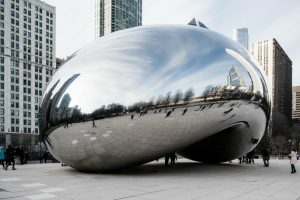 Despite its brief appearance, one can immediately recognize Cloud Gate (and the other works) in the video. These competing factors make the fair use analysis difficult. A deep dive into fair use law is beyond the scope of this article so we’ll have to let the court weigh in. Expect another article once the court rules.